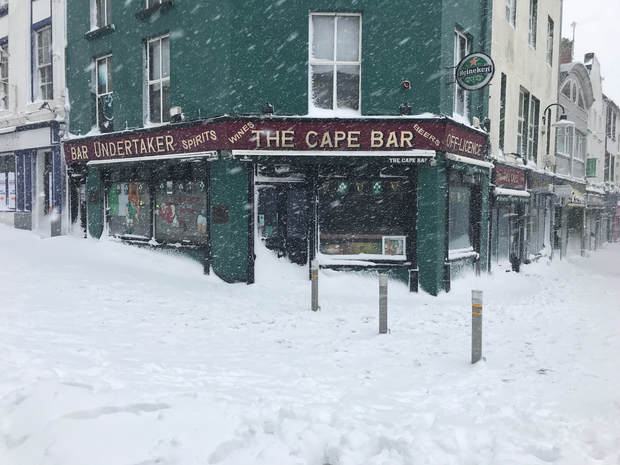 PARTS of east Leinster woke up to some of the most significant snowfalls resulting from the arrival of Storm Emma - with many towns left in lockdown this morning. Drifting is also causing big difficulties in many places. Towns such as Sallins, Clane and Straffan in Kildare were locked down today due to the extent and depth of the snow, which even meant that snowploughs could not be deployed. "The local chipper has a five foot drift in front of it, and the pub is snowed-in too. I can't open my own patios doors or a five foot drift will collapse in on top of me," said Fianna Fáil TD James Lawless. "The winds were very strong last night and that caused the drifting, and some businesses like the local shops and pub that had planned to open today have now decided to stay shut," he added. "The local roads are impassable. I was talking to a local contractor with nine snowploughs but they cannot be put into use at the moment because the safety operating them is a consideration also," deputy Lawless explained. "Nothing is moving in Sallins, and I hear it is the same in Clane and Straffan," he said. "The winds have abated now, but the snow is still falling," he added. Gardai have reported that cars are turning back on the outbound lane of the N7 after getting stuck at Citywest. "They are coming back in on the outbound carriageway after getting stuck and being unable to go any further, so people need to be careful because the outbound carriageway has become a road of two way traffic now," said a garda spokesman. "People should avoid that section of the road, and avoid travelling at all, if possible," he added. Parish priest for the Clane and Rathcoffey parish, Fr Paul O'Boyle, echoed Mr Lawless's observations, saying everybody was staying indoors and nobody was moving in the town. "There was a few cars on the road last night but nothing since. There's around a foot of snow on the ground but where it drifts at the edge of ditches and places it is very deep," he said. "We had mass yesterday but the church is closed for today, and maybe tomorrow too," he added. "We have lists and numbers of people living on their own or who may be vulnerable, and we are checking on them regularly to make sure they are OK and that they have enough food and fuel," Fr O'Boyle said. "People are bedded down. There is only word being talked about for the moment. Snow," he said. Sinn Fein Councillor Reada Cronin said that she is snowed in at her home in Maynooth, Co Kildare. She told Independent.ie: "I have never seen anything like this. "The snow is three or four feet high in some areas and it's still snowing, there are reports we will be getting even more. "I haven't seen any cars on the road so far today but most vehicles seem to be surrounded from around three foot of snow from what I've seen, who knows when we will be getting out again?" Ms Cronin also said that she is grateful for the emergency crews who have been tirelessly working through Storm Emma. "The crews in Kildare County Council have been working around the clock, it's times like these that you appreciate these services. "It's also a time to appreciate your home, a house is more than just shelter, it's home, we should be very grateful for what we have. "It's very much your shelter and refuge at times like these," she said. It is a similar story in Meath and Wicklow. Many roads are impassable in Meath with the snow reported to be waist high in places. Motorists have used social media to report roads blocked across the county including south meath, east meath and north of Navan near Kilberry. Many roads in Co Wicklow are impassible following heavy snow, including Wicklow Town, Arklow and Baltinglass. 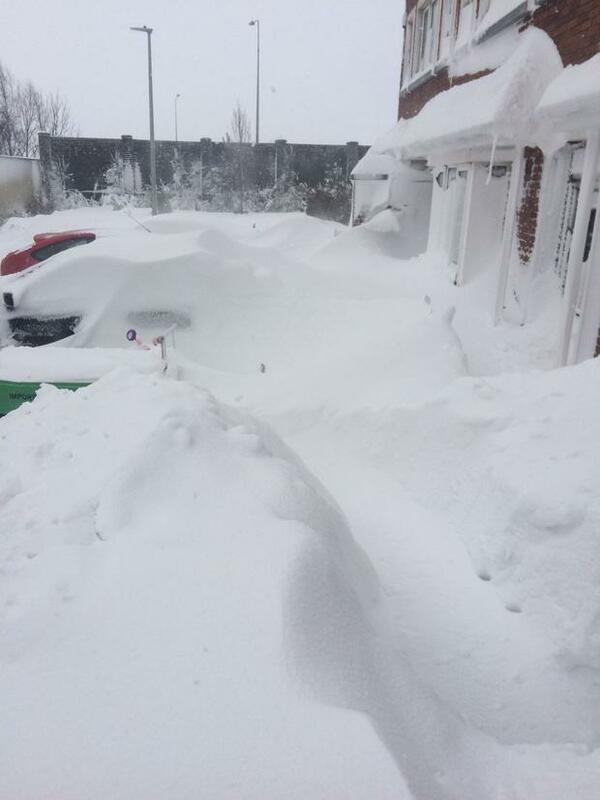 Grace Sheehan, who lives in Monaseed in Gorey, Co Wexford, describe the weather there as "blizzard-like." She told Independent.ie: "It's blizzard-like conditions, it's horrendous, it's definitely not getting any better, if anything it's deteriorating. 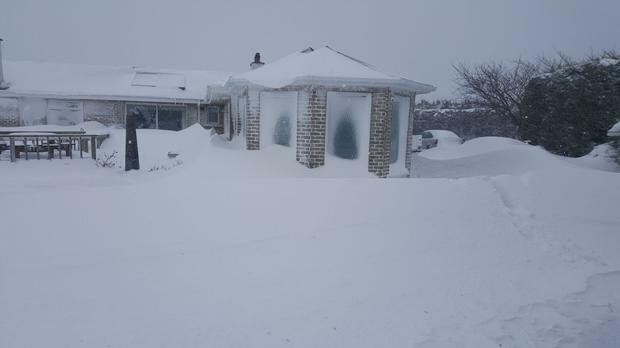 "We live on a local primary road and there are drifts that are up to eight foot high. "It's constantly snowing and the patio doors at the back of my house are almost covered in snow so you can't really see through them at this stage." 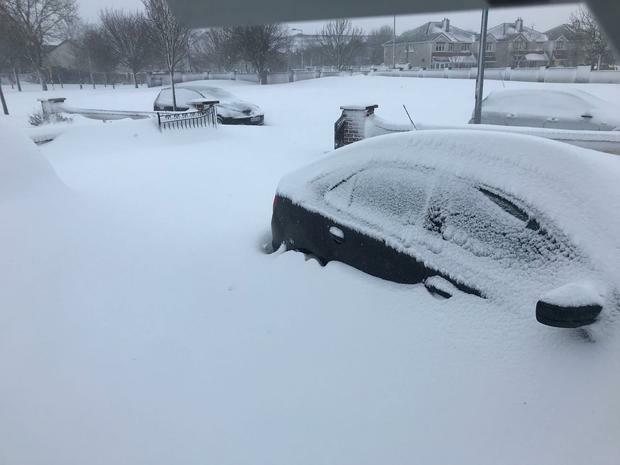 Locals in Rathcoole, Co Dublin have reported that snow is still falling heavily and heavy winds in the area are causing continued blizzard-like conditions. Janet Veighey, who lives near Redgap, said she has never seen conditions like today's in her 30 years in the area. "We always get it a bit worse but I've never seen anything like it," she said. "This is the worst I've ever seen it. [Snow] is pelting down and the wind is whipping it up as it's so dry so it's still blizzard conditions,"
"There is no way we are getting out but we're well stocked up," she said. Janet's electricity went overnight but was thankfully restored by this morning. She expects it may be Monday before she will be able to leave her home. Meanwhile, Eileen Mooney is snowed-in in another part of Rathcoole, with her husband Trevor and their four-year-old Jacob. She said she thinks the Government may have lifted the warning to stay indoors too early. "It still feels just as blizzard-like as it was last night. The snow is well up past our knees," she told Independent.ie. The family awoke to no electricity or broadband and TV services this morning but now have power again. "At least everyone is safe, that's the main thing," she said. Elsewhere in Co Kildare Freya Ryle (20) is snowed in with her younger sisters and her grandmother at her home in Clane, Co Kildare. She said that it is the worst snow she has ever experienced. "At the moment it's still snowing and there's a good bit of wind," she said. "There is about four foot of snow, I have a car in the driveway and I can't see any of it at the moment. "Back in 2010 I was only a kid but it was nothing in comparison to what it's like now. "My nana is here and she's telling us stories about the snow in 1982, it's a bit crazy. "The council have been out clearing and gritting the roads, so that's good and we are lucky that we still have our power. Her parents were due to fly home from New York today but haven't been able to get a flight back to Dublin yet. She told Independent.ie: "My parents are in New York and they were supposed to fly back today but they won't be able to get a flight back until Monday now. "All of our neighbours have been checking in on us, my nana lives in Meath but she was bringing my little sister to school and got snowed in with us too." 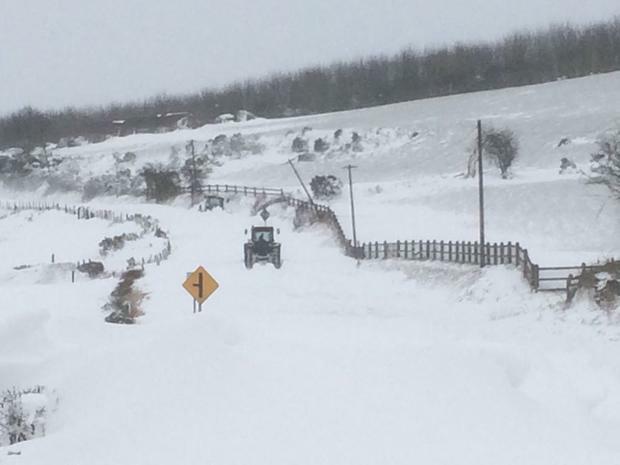 The snow is so severe on the road leading out of Oldcastle, Co Meath that a tractor got stuck. Fiona Blaney lives just below Patrickstown, in Kells and said she thinks they won't be able to leave their house for at least two days. She said: "It's really bad snow and frost, you literally cannot drive out of it and there's actually a tractor stuck on it at the moment. "There's no sign of any snowploughs here, I think it'll take at least two days to get us out unless we get a big thaw really quick. "Gritters won't be able to get down until snow is cleared because it's around four foot high. "Even the wind is so strong here. "My husband has a farm over in Virginia and he can't get over to see if his animals are okay, it's stressful."